At the beginning of my love affair with these cucumbers, I called them "Mexican Sour Gherkins" (the name on the seed packet I bought from rareseeds.com). A lovely and romantic name--but what a mouthful! Every time I'd try to spread the word about these awesome little cukes, I'd try to say it slowly...Mexican....sour...gherkins. Only to be met with silence and "....what?" I started calling them "Sanditas" (with a small sigh of relief) after I found a reference to them online by that name. I discovered after the fact that sanditas means "tiny watermelons" in Spanish. Perfect! Recently I saw another gardener refer to them as 'Cucamelons', and honestly, that may be my favorite name yet. No matter what you call them, Sanditas are a fun, tasty, and prolific crop. They start producing tiny blossoms very soon after they are planted, and once the impossibly tiny cucumbers start forming, it seems they never stop. 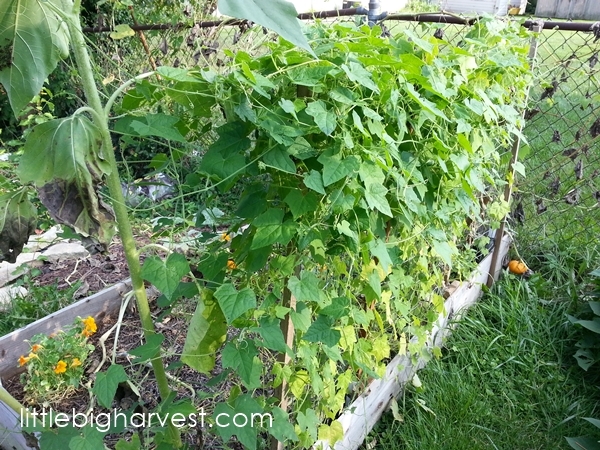 Over a month ago I wrote about my sudden and severe neglect of the garden. It made me sad to lose a lot of my gardening time this fall due to a new job. However, I'm happy to report that the sanditas survived the neglect quite well. They were the one crop that just kept going, and going, whether I was there or not. 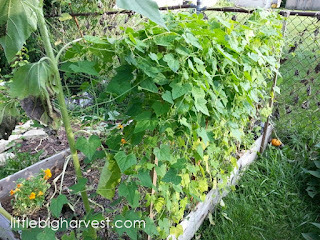 The bed they shared with pumpkins and melons had died off, fast and hard, when I didn't address the leaf mold that invaded (this is the method for combating leaf mold I had hoped to try). Although surrounded by brown dead leaves and plants, the sanditas only grew stronger and greener. They didn't get the memo that the bed had died, and only thrived with dozens of new cucumbers appearing like magic almost daily. 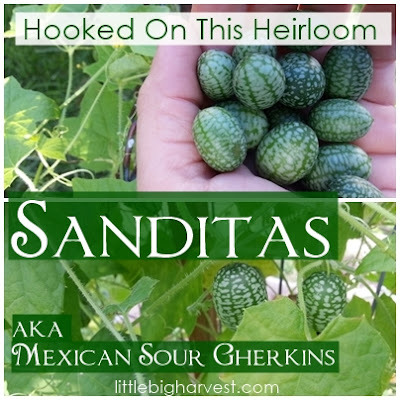 Why grow Sanditas/Mexican Sour Gherkins/Cucamelons? They are adorable. I mean really. Look at them! 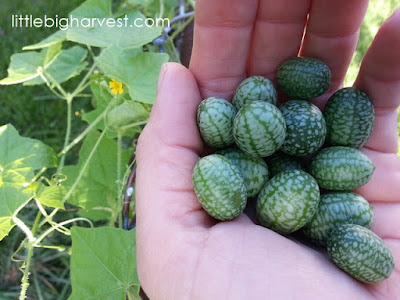 Itty-bitty cucumbers that are dead ringers for watermelons! Kids love to eat them and pretend they are watermelons for the smaller things in life, like Ninja Turtles, or My Little Ponies. 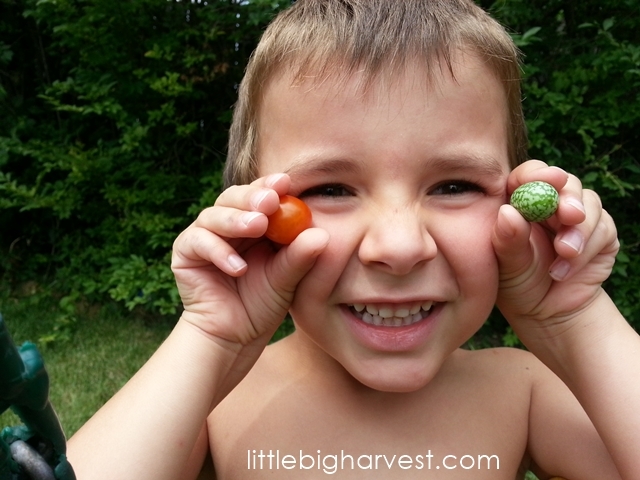 Cherry tomato on the left, sandita on the right...both the perfect tiny snacks for kids, straight from the garden! They are tasty. Though it can be difficult to describe, the closest I've come to explaining the flavor is this: lemony, crisp, sour and sweet. Since they are typically eaten in one bite, you get a nice burst of lemony tang when you pop one in your mouth and crunch it with your teeth. They produce like crazy. I'm hard-pressed to think of another crop in my garden that even comes close to producing as many fruits. Green beans come in a close second, perhaps. 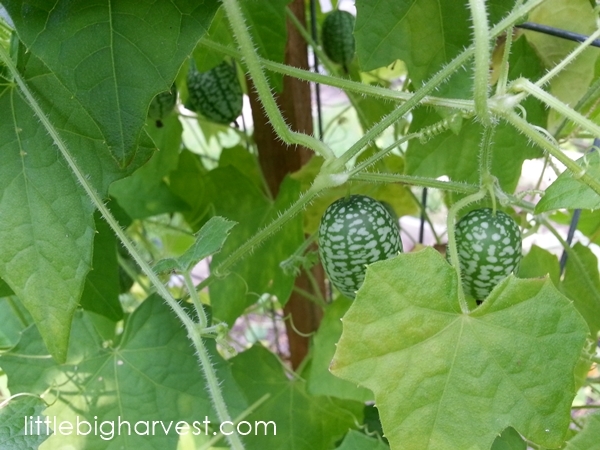 You will find dozens of cucumbers consistently through the season, and if you let them go for a few weeks like I did this fall, you will be able to fill up entire quart jars and perhaps even pickle some for later. They take up very little space. I once heard someone describe sanditas as the perfect plant for a cottage garden (or maybe I read that on the seed catalog description). It sounded so quaint! When I looked up 'cottage garden', I realized it really is my garden style. If you like to cram lots of plants into little spaces, sanditas are a great choice for you, too! They are very hardy. My most recent sandita harvest was especially exciting since the bed they were growing in was nearly decimated by some type of wilt. Virtually all the pumpkin and melon vines wilted away to nothing--dried up and dead--while the sandita vines only grew stronger and greener. To me, this indicates they are resistant to wilt. In the three years I've grown them, I've never seen a single pest bother them, even as neighboring plants got eaten alive. This is a little veggie that puts up quite a fight! Saving cucumber seeds sounds a bit tricky, and I haven't tried it yet. Check out this list of seed-saving techniques. Scroll down for a how-to on cucumbers. I plan to try saving sandita seeds next year, so I can keep growing and sharing! What? Are you serious! This is the first time I am seeing cucumbers of such tiny sizes. They look so cute. I don't know if I will be able to get them planted at my place. I so want to have these in my garden.